So, how exactly would one explain under FE theory that the star field could rotate in TWO directions at the same time? (not even including near the equator where the paths are perpendicular). The stars spin in opposite directions over certain areas because that is what is observed. That's simply how the stars move. The turning of the "gears" keep each other generally moving in opposite directions. Not literal gears, but celestial systems rubbing against each other, affecting each other gravometrically. Over the Flat Earth exists a number of stellar multiple systems. One is over Australia, one is over South America, and another is over the North Pole. Each have unique properties and keep each other in motion via gravitational gears. Formation was caused by a conglomerate of stellar interactions and the influence of the sun which makes a path through the teeth of these gears. The movement of these stars is what is attributed to the Focault Pendulum, Corolis Effect, gyroscopes, and other spinning phenomena. Bodies will be captured geometrically and propelled in the direction and apogee of the close stars overhead, which make one rotation around the hub per twenty four hours. The South Celestial Systems over the Southern Hemisphere are spinning in the opposite direction and so bodies will be deflected in the opposite direction. As for why the stars spin in different directions over different parts of the earth; that's more of a hypothetical question. No true answer will ever be given because astronomy is completely observational. There is no experimentation in Astronomy. Any number of stellar models could be created to explain the movements of such intricate multiple systems. The stars move at the same rate, in opposite hemispheres of the Earth. Constellations are an easy verification that the stars always matched up and don't twist over a long distance over the equator. The same constellations are viewed in the appropriate places and times on Earth every night. b)How would stars at the north/south poles with higher inclination from the horizon appear to follow concentric circles which diminish in radius as they near 90 degrees? How would these stars remain in view for the entire summer without ever falling below the horizon? c) why would one halfway between a pole and the equator not be able to see where one "gear" ends and the next begins? d) If the sets of stars were separate and rotating on opposing axis why do the stars appear motionless in relation to each other from every point on earth? e)Why would an observer on the equator be able to see stars/consolations from both hemispheres at the same time, yet still not observe any opposing rotations? f) How could two separate observers, one on the very "edge" (south pole) and another 5000 miles to the north both see the same constellation from nearly identical perspectives when it is only 3100 miles away? 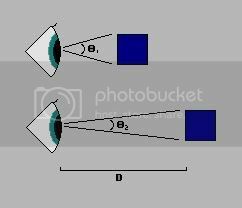 Hint: Make a right angle triangle with 5000km opposite edge and 3100km adjacent edge, using trig calculate the angle between observer A and observer B. In other words the two observers would be viewing the consolation from very different perspectives (squished stars anyone?). If you don't believe me there is simple way to see the effects. find a flat round object (coin would do nicely) and hold it up with its face perpendicular to your line of sight, Now just rotate the coin in any direction keeping the face visible. If the laws of physics apply to you (unlike Bishop) you should see the results (no you don't have magic coin squishing powers). There is no evidence for an infinite Earth. Warning, you have just lowered your IQ by reading my sig. This is no problem for FE. The dynamics of a multiple stellar system demand that every body of a swirling star system move in tandem with each member body as if the entire system were a solid disk. The underlying cause for the rotation is due to vast cornucopia of stellar systems orbiting around its center of mass - an imaginary point completely compliant with the Newtonian system. This is an extrapolated and more complex binary star movement, where the stars move around around a shared gravitational influence. Each star in a cluster is attracted to one another through a shared gravometric influence. Formation is created through gravitational capture - at least three objects are actually required, as conservation of energy rules out a single gravitating body capturing another. The stars maintain their movement over the years through Newton's first law: An object at rest tends to stay at rest and an object in motion tends to stay in motion with the same speed and in the same direction unless acted upon by an unbalanced force. The stars in the night sky trace almost perfect circles around the hub of the earth because by necessity the mechanics of a multiple system rely intimately on the movements and vectors of every member body. Circular movement is the most perfect, stable movement. If one celestial body is out of place or moves in a different fashion than the other bodies of the group the entire system becomes inherently imbalanced. Eddies, or stars that move out of tandem, will either leave the system entirely or are compelled by the stellar system to move back into its locked pace and apogee. This is why there are no elliptical orbits, and why an entire cluster moves at a set uniform speed. Galaxies also actually rotate at a set uniform speed and apogee throughout its disk. Galaxies move as if they were a solid disk. Describing the movements of galaxies have been a challenge to astronomers, requiring the dynamics of multiple star systems we know today. "According to theory, a galaxy should rotate faster at the center than at the edges. This is similar to how an ice-skater rotates: when she extends her arms she moves more slowly, when she either extends her arms above her head or keeps them close to the body she starts to rotate more rapidly. Taking into consideration how gravitation connects the stars in the galaxy the predicted result is that average orbital speed of a star at a specified distance away from the center would decrease inversely with the square root of the radius of the orbit (the dashed line, A, in figure below). However observations show that the galaxy rotates as if it is a solid disk – as if stars are much more strongly connected to each other (the solid line, B, in the figure below)." "In 1959, Louise Volders demonstrated that spiral galaxy M33 does not spin as expected according to Keplerian dynamics, a result which was extended to many other spiral galaxies during the seventies. Based on this model, matter (such as stars and gas) in the disk portion of a spiral should orbit the center of the galaxy similar to the way in which planets in the solar system orbit the sun, that is, according to Newtonian mechanics. Based on this, it would be expected that the average orbital speed of an object at a specified distance away from the majority of the mass distribution would decrease inversely with the square root of the radius of the orbit (the dashed line in Fig. 1). At the time of the discovery of the discrepancy, it was thought that most of the mass of the galaxy had to be in the galactic bulge, near the center. Observations of the rotation curve of spirals, however, do not bear this out. 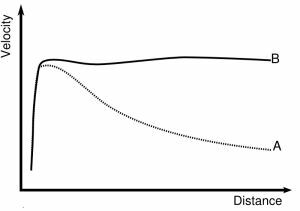 Rather, the curves do not decrease in the expected inverse square root relationship but are "flat" -- outside of the central bulge the speed is nearly a constant function of radius (the solid line Fig. 1). The explanation that requires the least adjustment to the physical laws of the universe is that there is a substantial amount of matter far from the center of the galaxy that is not emitting light in the mass-to-light ratio of the central bulge. This extra mass is proposed by astronomers to be due to dark matter within the galactic halo, the existence of which was first posited by Fritz Zwicky some 40 years earlier in his studies of the masses of galaxy clusters. Presently, there are a large number of pieces of observational evidence that point to the presence of cold dark matter, and its existence is a major feature of the present Lambda-CDM model that describes the cosmology of the universe." Therefore, since galaxies rotate in the same fashion as the stellar systems over our heads, we see that there is a pretense for the multiple system I've described. If a person is directly beneath one of the south celestial systems he will witness the stars rotating around him at the rate of one rotation per twenty four hours. The stars directly above him are closer to the observer, the stars near the horizon are farther from the observer. The stars which remain in view throughout the summer are the inner stars near the center of rotation. If Sigma Octantis (the south pole star) is visible from a location, then the inner stars which rotate around it will also usually be visible. This allows a constellation near Sigma Octantis to stay in view throughout the summer. The same goes for the stars in the North. If Polaris (the North Star) is in view then the inner stars which rotate around it will also usually stay in view. The stars aren't motionless. The stars are constantly in motion. In the North the stars spin in one direction, in the South the stars spin in an opposite direction. On the equator you will see stars moving in completely opposite directions. See the previous link. The stars aren't motionless. The stars are constantly in motion at a rate of one rotation per twenty four hours. Opposing rotations ARE observed. See the link I provided two questions up. It's a time elapsed star trail taken from the equator, showing opposing rotations. The position of the stars in the sky depends on their distance from the observer. It's a matter of perspective, which is why some constellations appear lower in the sky than others. I have to go but I promise I'll be back. But before I do I looked at the link with the star picture. What is your explanation for them cutting down into the FE instead of slowing toward the vanishing point of perspective? This is no problem for FE. The dynamics of a multiple stellar system demand that every body of a swirling star system move in tandem with each member body as if the entire system were a solid disk. -The centre rotate at a lower speed. The whole universe rotating in this fashion, with an orbital period of one day, would be truly amazing. it's safe to say that Modern Science is completely hypothetical and is simply waiting to be replaced. My, how we change our spots to suit us! I haven't performed it and I've never claimed to. I've have trouble being in two places at the same time. The answer to that is the very same answer as to why the sun and moon cuts into the earth. The vanishing point is a finite distance away from the observer, not an infinite distance away as commonly assumed. This causes bodies to cut into the earth after a distance as their bottom halves intersect with the vanishing point. If the perspective lines truly did reach out into infinity a distant ship sitting on top of the horizon line would be an infinite distance away from the observer. Since, as we all can agree, a distant ship sitting on the horizon line is not an infinite distance away from the observer we can conclude that the perspective lines do not reach out into infinity. The vanishing point is therefore a finite distance away. As I recall this is an observation that you'd expect to make on a Round Earth, where there is a Horizon. Not on a FE where the horizon should be at infinity. IOW your first diagram is representative of FE and the second of RE. You state that it is the other way around. Fail. tell me how your model explains why deep-dripping Russian geologists found an impenetrable layer of turtle shell when attempting to breach the crust of the earth. Why? That's just the way things are. The perspective lines cannot reach out into infinity on a Flat Earth because that would mean that as a departing ship ascends into the distance towards eye level, it must be an infinite distance away upon reaching the horizon line. A ship would not be able to sit on the horizon line because, if the perspective lines stretched into infinity, a ship sitting on the horizon must be an infinite distance away. Since we can agree that a ship sitting on the horizon is clearly possible, we must conclude that if the earth is flat, the perspective lines must intersect at a finite distance from the observer to allow this common sight to occur. What makes you think that the perspective lines should reach out into infinity? Now in a FE you are saying that a ship at 'H' sits on top of the horizon. What will I see of another vessel sitting at 'W'? And WHY? And what mechanism leads to this 'perspective effect'? Perspective lines should reach towards infinity because the angle you receive light from it approaches zero as distance increases. Objects don't snap in and out of existence at certain lengths away. There is no reason I can see (pun intended ) for perspective to selectively cut out parts of your vision. Not so great diagram, but it makes the point that the angle will never equal zero. Only approach it as D is larger. On an infinite flat plain, not the round earth, it would be impossible for a distant ship (no matter how distant) to sit on the horizon line. Things appear to get proportionally smaller as they are further way. That's all perspective is. That diagram (and the theory behind it) is fundamentally wrong. You must know that by now. Late addition - the diagram my L0gic (above) explains it brilliantly, in simple terms, with the eye's angle of view on the object. Does not explain how a person ANYWHERE along the "edge" or your flat earth would see precisely the same stars in the same positions. In other words someone 8000 miles east of the northern "celestial systems" center could not possibly see the same stars on the horizon, or directly above for that matter. The North Star (http://en.wikipedia.org/wiki/North_Star) is circumpolar to the North Celestial Pole and follows the shortest ( about 2/3 of 1 degree) circular path of any relatively bright star over the north pole. It therefore appears to the north in any part of the Northern Hemisphere in which it is above the horizon. This current north star is at the end of the Little Dippers "handle". How is it possible under FE theory to explain how when observed from other parts of the Northern Hemisphere the north star appears to travel in anarc of varying circumference anywhere from a few degree (closer to the equator) to 90 degrees (in the north pole) above the horizon varying with the observers latitude. Where I live (Canada) the North Star/"Little Dipper" consolation appear to travels in a WIDE arc roughly 30 degrees above the horizon. The stars aren't motionless. The stars are constantly in motion. In the North the stars spin in one direction, in the South the stars spin in an opposite direction. You conveniently left out the trigonometry showing that if stars were on a flat plane 3100 miles up it would be impossible for consolations (like the Little Dipper) to appear with exactly the same dimensional properties anywhere on the globe where those same consolations can be observed. "There is a theory which states that if ever anybody discovers exactly what the Universe is for and why it is here, it will instantly disappear and be replaced by something even more bizarre and inexplicable." TB, your long winded posts that explain nothing using stupid made-up science never cease to amaze me. ENaG: Evidence Not a Guarantee. Wouldn't the rotation of the stars have to be more like this? In order to avoid the gears having opposite rotations next to each other, like in tom Bishop's animation? Thank you for the visuals. You're good with those. Its so hard to convey that concept without them. scientists believe the star Alpha Centauri to be the closest star, at only 4 light-years distance. why? because they observed the way it's position seemed to shift relative to other stars at different times of the year! Tom's model also totally fails to mention, much less explain, the movements of mars, jupiter, etc through the sky. people used to believe that EVERY ONE of them had a unique disk of it's own that periodically reversed direction! Copernicus came up with a much simpler model, which every non-FEr accepts. Good post. Still wouldn't explain the southern Celestial Pole however. Yes its hard sometimes to interpret exactly what TB is trying to say, besides its obvious erroneous nature of course. Makes me wonder if he himself knows what he is talking about half the time. Btw has anyone seen TB around since noonish? As far as i can tell he never responded to several challenges by various individuals. Made a hasty retreat to the Fortress of Ignorance perhaps? He has done that nearly 7 times in a row in my presence or when I am watching. I know. I'm not on that much anymore. Tom Bishop is representative of the theory as a whole, fantastical explanations of observations using ideas he can neither prove nor understand. And TB, what magical explanation have you come up with to explain why these gravitational gears exist? What's that? You have none? And the RESPONSES ARE LACKING thread with a bunch of others inside? None have been replied to despite being bumped sufficently and advertised. He began addressing issues and then ran off for a month when it got difficult. l0gic is that you in your photobucket profile with the picture "newme"? Yes. Now back to topic. Did Tom remove the gears? The link from Yiak's quote still has them but I cannot remember if he posted them on this thread again. Wouldn't be surprised though. No point. He can;t explain these gravitational gears, so he's going to let them slide into the back pages/move them to angry ranting. this reminds me of something i read somewhere: the stars are on a dome, mars is on a giant tetrahedron (4 triangular sides), jupiter is on a giant cube, etc. a VERY old system that never did form a coherent picture. someone in 190 BC who said the earth went around the sun!